IT is always gratifying to find out that straight shooting and high level security professionals have arrived at the same general conclusions as this Muslim Brotherhood expert and investigative journalist. INTRINSICALLY, the aforementioned is in reference to the part played by Obama Inc. in “setting the stage” for the rise of ISIS, and its eventual declaration as the Islamic Caliphate. Well, said assessment may have appeared a tad “conspiratorial” in certain quarters, when first expounded at this site. No matter. No longer. EFFECTIVELY, let’s hark back to particular dots which were previously connected, going as far back as 2013. AS the world stares transfixed by the speed in which ISIS captured Ramadi and Palmyra, it must be internalized where the hydra-like monsters spawned from. This knowledge base will explain how they catapulted into top-tier status. Forthwith, let’s begin connecting the dots. It is only by taking the time to do so that we can properly extrapolate what HUSSEIN Obama’s game plan really is. ALAS, it was previously asserted (Oct. 2013), while assessing the illegal war into Libya – with Benghazigate as its outgrowth – that the main objective was a weapons-running operation F/B/O Syrian Sunni jihadists and the empowerment of the Muslim Brotherhood Mafia. Caliphate-driven. Concomitantly, the Brotherhood is the parent of al-Qaeda and ISIS is its offshoot. SO as repeatedly proven, ISIS is an offshoot of al-Qaeda in Iraq, andal-Qaeda is a product of the Brotherhood Mafia. Simple as that…. RESULTANT, why wouldn’t the very same “benefactors” of ISIS (al-Qaeda/MB alike) train a so-called Islamist “police commander” – plus countless others – rather than deny them elite training on U.S. soil too? Rhetorical. A fighter with the Islamic State group in a new online video was trained in counterterrorism tactics in the U.S., the State Department confirmed.…continue reading…. BUT even as hard as it is to conceive that a malignant POTUS would (and could) subvert the entire national apparatus and interest – and with an impotent and somewhat colluding Congress barely taking him on – the proofs are more than manifest. Indicting. Alas, former head of the DIA – Lieutenant General Michael Flynn – confirmed this site’s thesis, as gleaned from a RECENTLY (emphasis placed) leaked Defense Intelligence Agency document. 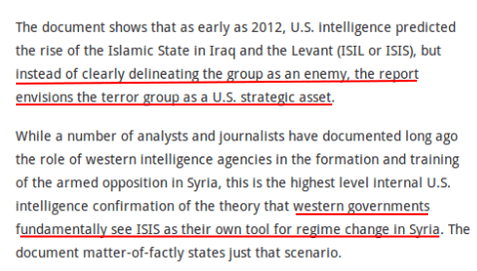 An internal Defense Intelligence Agency (DIA) document produced recently shows that the U.S. knew that the actions of “the West, Gulf countries and Turkey” in Syria might create a terrorist group like ISIS and an Islamic caliphate. [Interviewer] A willful decision to support an insurgency that had Salafists, Al Qaeda and the Muslim Brotherhood? Hasan: In 2012 the U.S. was helping coordinate arms transfers to those same groups [Salafists, Muslim Brotherhood, Al Qaeda in Iraq], why did you not stop that if you’re worried about the rise of quote-unquote Islamic extremists? Flynn: I hate to say it’s not my job…but that…my job was to…was to to ensure that the accuracy of our intelligence that was being presented was as good as it could be. MIND you, it is important to note that Turkey’s Erdogan, HUSSEIN Obama’s closest ally in the Mid East – highlighted within the DIA report – had been singled out as a Caliphate/Brotherhood/ISIS beneficiary at these pages as a key player, and more than once. At major interviews alike. Okay. CONCLUSIVELY, it is not as if the U.S. is new to climbing into bed with Islamists. Not at all. In fact, through a grave geo-political miscalculation (let alone lack of understanding as to the ultimate goals of Islam’s warriors, as well as due to the prodding of National Security Advisor Zbigniew Brzezinski, an inveterate lover of Arabs/Muslims and the go to guy during this period) the CIA funded and trained the mujahideen, aka Al Qaeda and the Taliban, to rout the Russians from Afghanistan. ADDITIONALLY, Brzezinski is also an influential foreign policy adviser to HUSSEIN Obama! The “plot” thickens. STRATEGICALLY speaking, the strategy to counter the Russians by training Islamic barbarians was beyond miscalculated. No, this is not a 20/20 hindsight observation, but that which is borne from a deep knowledge base, relative to warriors inspired by the Koran! Not only that, preceding Islamic inspired terror attacks – from the earliest part of the 20th century – displayed what Allah’s soldiers understood as their duty to protect the ummah, regardless of all else. HOWEVER, in the main, most – though not all – of America’s top tier were looking out for U.S. interests during the proxy war with Russia. Its blow back hardly requires edification. 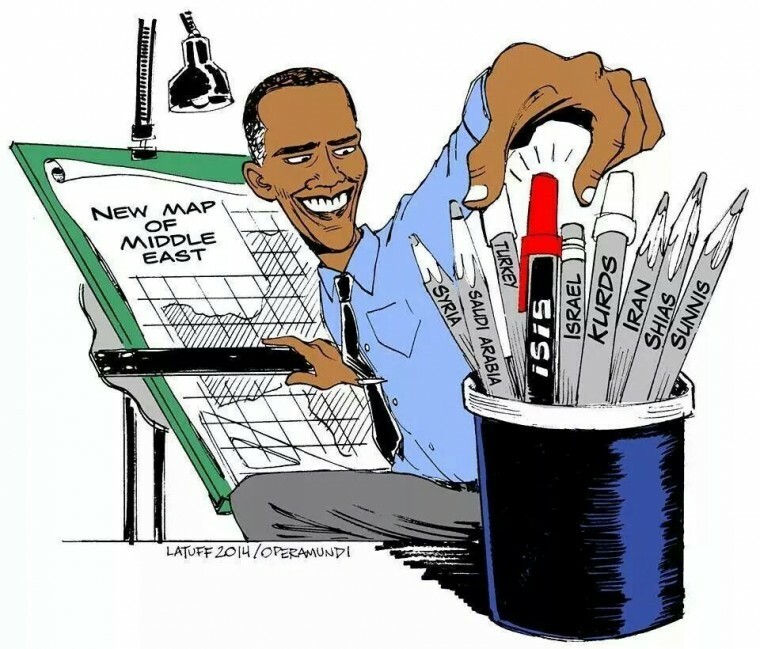 NEVERTHELESS, instead of internalizing the lessons learned – as byproducts of aligning, by proxy or otherwise, with Islamic jihadists –HUSSEIN Obama and surrogates aim for an anti-American outcome. Incontrovertibly. AS is said, this is where the rubber meets the road. Inherently, the above (plus enumerable proofs scattered throughout this site and elsewhere) demonstrates how ISIS became the mega force it quickly morphed into, thereby, possessing the ability to declare a Caliphate in such short order. 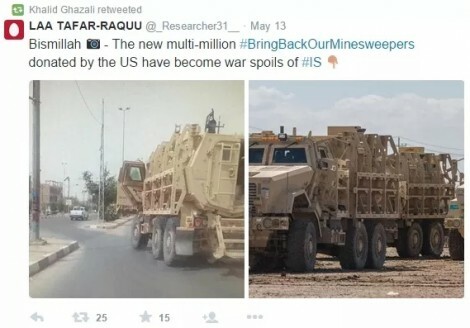 CONSEQUENTIALLY, how much should be accrued to happenstance, bad luck or the like, when a treasure trove of high grade U.S. military hardware was left behind for ISIS (and aligned groups) to inherit? 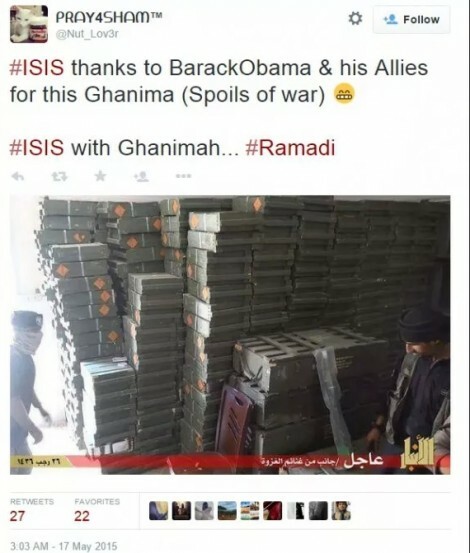 Additional military prizes, courtesy of Obama, included numerous stacks of weapons crates that were full of the latest and greatest small arms and explosives that will undoubtedly be used against America and our allies in the future. HMM…”spoils of war” is one way to look at it. More accurately, purposefully gifted booty! !